Peel and finely chop the garlic and onion. Finely chop the celery stalks too. Fry them all gently in the olive oil in a heavy saucepan until soft but not coloured, stirring occasionally, about 10 minutes. Meanwhile, snap the tough ends off the asparagus and top and tail the beans, then finely dice them. Mix the chopped asparagus and beans with the podded peas and broad beans and then divide the mixture between two bowls. Peel and dice the potatoes and add them all to the first bowl. Add the first bowl of vegetables to the softened onions and cook for another 5 minutes, stirring occasionally. Season. Add enough stock to just cover, bring to the boil and then simmer for around 20 minutes, until potatoes are tender. Add remaining vegetables to soup, and more stock if needed, and cook 5 minutes. Meanwhile chiffonade the mint leaves. 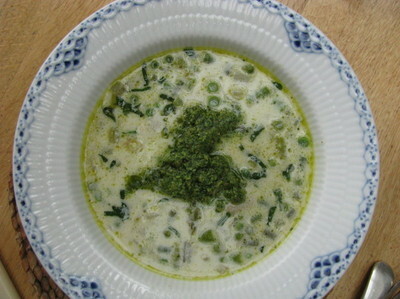 Remove soup from heat and stir in mint and cream. Taste and season. Serve warm or room temperature with a dollop of pesto on top for the diner to swirl into their soup.